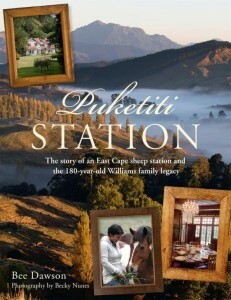 The story of Puketiti Station, the 180-year-old Williams family legacy and how an airline pilot and his wife from Auckland inherited a new life farming on the East Cape. Puketiti Station, the Category 1 historic homestead, cobbled stables, and covenanted gardens at its heart lie hidden above the sands and breakers of the east coast, 100 kilometres north of Gisborne, on the road to Ruatoria. Puketiti was once the headquarters of the enormous 40,000-acre Waipiro block, first purchased by missionary William Williams’ son James in 1883. Passed down through successive generations of the Williams blood line, Puketiti found itself in unsuspecting hands when the eccentric Des Williams’ died a bachelor in 1997. Attending his tangi were 22 godchildren. One of them, 27-year-old Dan Russell, hitchhiked to Puketiti from Auckland with nothing more in mind than to pay his respects. But on his arrival Dan was greeted with the news that would change his life forever. He had inherited the entire station – the homestead, its historic outbuildings, 3000-hectares of productive hill country and nearly 20,000 stock units, all debt free. Dan had visited the farm only a handful of times in his lifetime, and with a career as an airline pilot planned out before him, Dan and his city-girl wife from Auckland, Anna, were in disbelief. Des Williams’ only wish was that Dan keep Puketiti as a working sheep and cattle station. He feared others might succumb to the prolific offshore corporate investment in forestry threatening the historic stations on the east coast. Over 15 years on, Dan and Anna are still coming to terms with their new lives on this most remote and romantic of New Zealand’s historic stations, a traditional way of life in the backblocks of beyond, true to the Williams legacy, but it hasn’t come easy.